Autocoat Engineering (I) Pvt. Ltd. is already in manufacturing of painting plant on Turn Key Basis having supplied many large Spray Painting Booth & Conveyorised Phosphating & Painting plant all over India, Bahrain, Dubai, Saudi Arabia, Egypt etc. An Automatic Painting System has a Painting Booth composed of a partition having side Walls, a Ceiling, and a Floor which jointly define a working space isolated by the partition from exterior space for accommodating a work piece to be painted in a position therein. The partition has air inlet and outlet ports opening into the working space. A movable painting mechanism such as a Automatic Spray Gun is disposed adjacent to the work piece position and controlled by a control unit disposed outside of the Painting Booth and including a Drive source. The control unit and the movable painting mechanism are interconnected by an arm accommodated in an arm housing extending through the partition with a sealing member hermetically sealing a gap between the arm housing and the partition. High volumes Toy Painting Line or Toy Painting Line are very popular in China & vide rage of models are competively priced for good quality product. 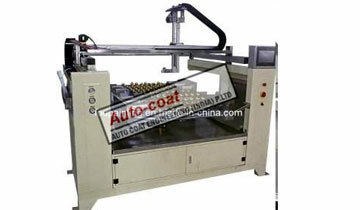 Autocoat have tie up with reputed companies from China, leading manufacturer for Automatic Painting Machine, Automatic Painting Lines, Auto Spray Painting Line without Robot, Portable Auto Painting Machine. These machines can be added on with small air supply units and infrared and UV ovens. The basic need for automatic painting machine is that the quality of painting cannot be matched with manual spray painting, high production capacity can be achieved a comparatively less cost when compared with the painting practice in India. 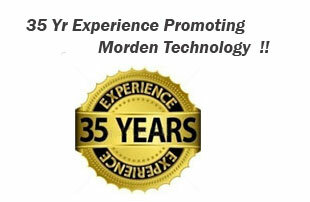 These products are imported, tested as per international standards, and we stand in hand to hand with these products. 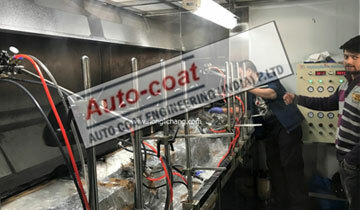 Autocoat has tie up with Chinese Companies after careful evaluation considering following. 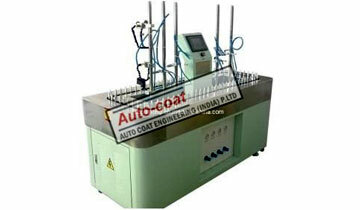 Autocoat Engineering is the most experienced Painting Plant Manufacturer in India since last 35 years. Autocoat Engineering has been supplier Automatic Painting Machine in India among other valuable products .We have wide experience of manufacturing of Painting Plant with different material handling and different product size , and different production volume.